Welcome to TheViperStore.com a Hot Car Accessories, inc. store! We sell all factory OEM Dodge Viper and RAM SRT-10 Parts - new and used at great prices. In addition, we offer unique Dodge Viper Accessories that you can only find here! The Dodge Viper is one of the most exciting cars in the world and certainly the premiere American muscle car! For owners of these high powered 'Snakes' we offer trim and upgrade products to accentuate your prized possession. Whether you own a Viper RT-10, Viper GTS, Viper SRT-10, a coupe or a convertible, or even a RAM SRT/10, from a full line of MOPAR parts as well as engine performance parts to simply the coolest look around we have got some great unique aftermarket accessories for you. 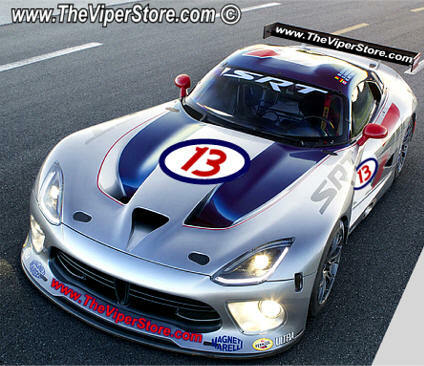 In fact we offer the World's largest selection of Viper parts & accessories. We carry hundreds of parts and accessories all specifically made for the Dodge Viper nearly all made in the USA. Check out all our newest parts including a new line of accessories specifically for the Viper SRT-10 Generation 4 (2008 - 2010) and of course the New SRT Viper Gen 5 (2013-current). We here at The Viper Store (TVS) take great pride in offering these high quality handcrafted, made in America Dodge Viper upgrades and accessories. These new accessories give your Dodge Viper RT/10, Dodge Viper GTS or Viper SRT-10 a custom look to distinguish it from the crowd. We've taken a little 'American ingenuity' by designing and manufacturing unique accessories that are of the highest quality - yet affordable. We continue to add new and exciting upgrade accessories to our product line-up with more new products coming out periodically. We currently offer many Dodge Viper products that are brand new to the market place. You will not find our fine custom Viper parts and accessory products anywhere else in the World! They are designed and manufactured for The Viper Store here in Central Florida specifically for the Dodge Viper. We supply our loyal customers around the world, including 55 US States and US territories as well as some 56 countries. As we bring new products to the Viper enthusiast marketplace we first try them out on our local Dodge Viper Community to make any adjustments that need to be made. Once completed we offer them here at TVS. We feel they are the best new products on the market for our much beloved and respected Dodge Viper.